Summer is the time of sitting back with a wonderfully icy margarita and a good book in hand, letting our minds wander off to far off places, meet new characters or learn something new. Or maybe with the weather we've been having, we can just stick with our quintessential Seattle mug of coffee. Here's a round up of the diverse books our staff have been reading this summer. From memoirs to thrillers to cookbooks and everything in between... maybe it'll inspire you to add something to your reading list? "Happy City covers a lot of livability issues around not only urban design and resiliency, but goes beyond a typical architectural scope and into supportive social networks and community"
"My suggested read out of the 8 books I'm currently reading: Midnight at the Pera Palace is a book about the history of modern Istanbul." "A beautifully photographed book of recipes that take a fresh look on Quebec (my home! )'s local cuisine. I follow her food blog and all her recipes are oh-so tasty"
"The landscape of the West and modern Native-American culture are included as important aspects of each story. I started reading the books after getting hooked on the show Longmire now on Netflix. The writing has kept me reading the books." "Been slowly working my way through this one. Kenya Hara is the art director for MUJI. I like it so far because it’s not just a monograph with nice photos of his work, but includes a lot of writing that gives more insight into his design thinking." "Just getting into this, but it’s a biography on a German citizen, Dietrich Bonhoeffer, who attempted to assassinate Adolf Hitler." "A Virginia Woolf classic about a day in the life of a woman living in post-WWI England. I’m only a few pages in but am curious to see how I end up liking it – so far it hasn’t been the easiest read!" "The story traces the journey of a Hebrew manuscript, called the Sarajevo Haggadah, through time. Through a series of short stories, the reader gets glimpses into the lives of the people who helped create, transform and protect the important manuscript. I enjoyed learning about historical events and periods through these stories." "It's currently doing its premier run at London's West End, but the script will be available on July 31 (Harry's Birthday) for those of us unable to make it across the pond for a live performance. I reread the HP series almost every summer and am so pleased to have some new material to supplement that journey!" "It’s the author’s fourth book in his Civil War series, and describes William Tecumseh Sherman’s March to the Sea. It details Sherman’s decisions, the battles as his troops cut through the heart of the South, and explains the important role this march played in bringing an end to the war. An excellent read for history buffs." "A bit of "light" reading about the growth of Islamic fundamentalism, the rise of Al-Qaeda and ISIS, and terrorism in recent times." "Ella was reading a kid-friendly version of Ali Baba and the Forty Thieves in her Cricket magazine and I was compelled to revisit the rest of these tales of far-off places." What books are you looking forward to reading this summer? Let us know by leaving a comment below. 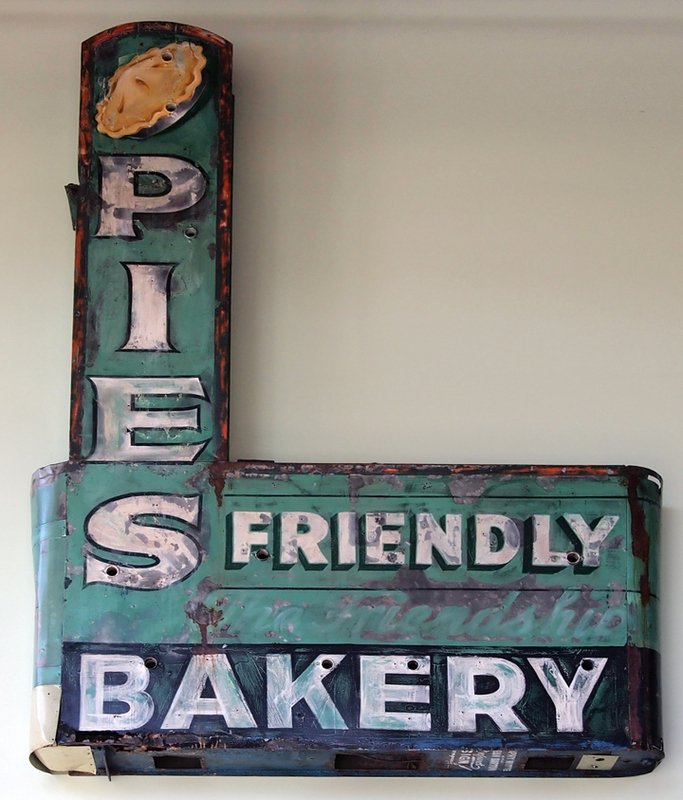 From the mint-green colored signage and espresso machine (a custom color), to the fonts and furnishings, Dani's latest space uses a few, modest but strategic elements to express her devotion to strip-inspired American modernist design, a nostalgia fitting her selling that most American of treats, the pie. The counter design is economical -- especially nice is the combination of the chrome edge band, black counter surface, and bead board around the machine. Basic, effective, and economical. 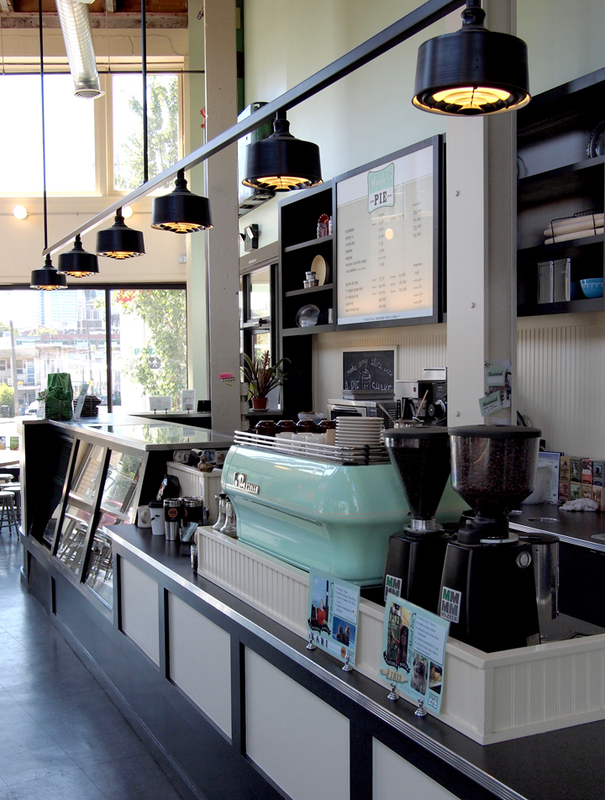 The color of the High 5 logo and espresso machine is pure mid-century. In the top photo, note the sign in the distance, also a handsome placard, from the soon to be opened Rex. 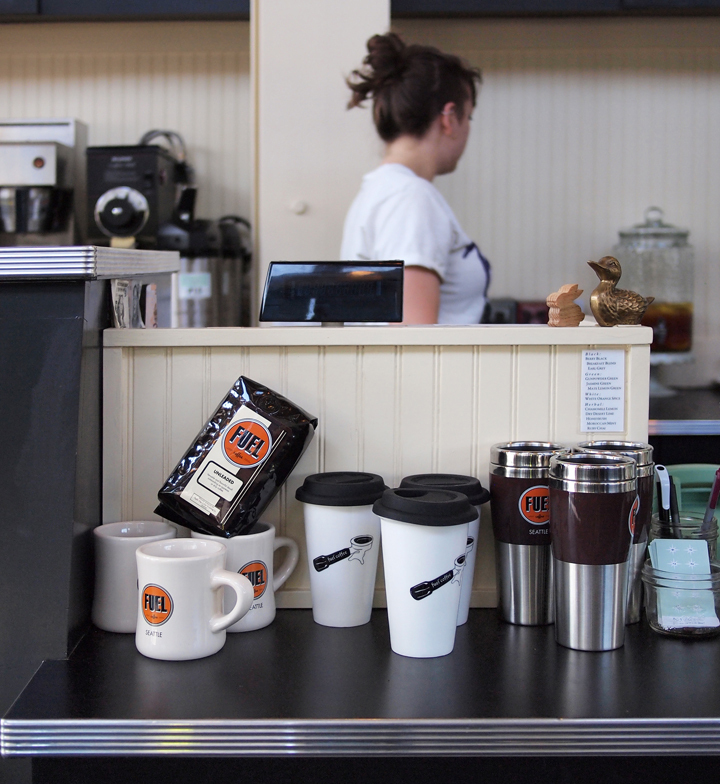 Fuel coffee is, of course, served at High 5. The shape of the logo-mug is a classic, and is just right for the Gulf Oil inspired logo. 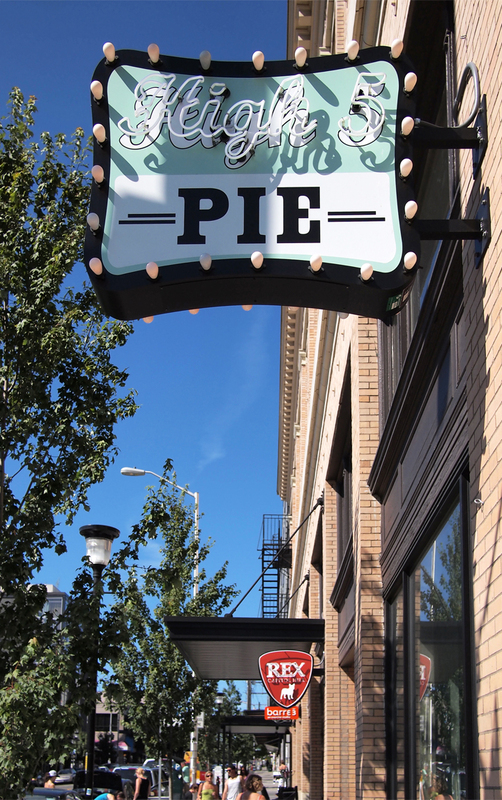 While not exactly home-made, High 5 Pies are had crafted by skilled bakers, on the premises. 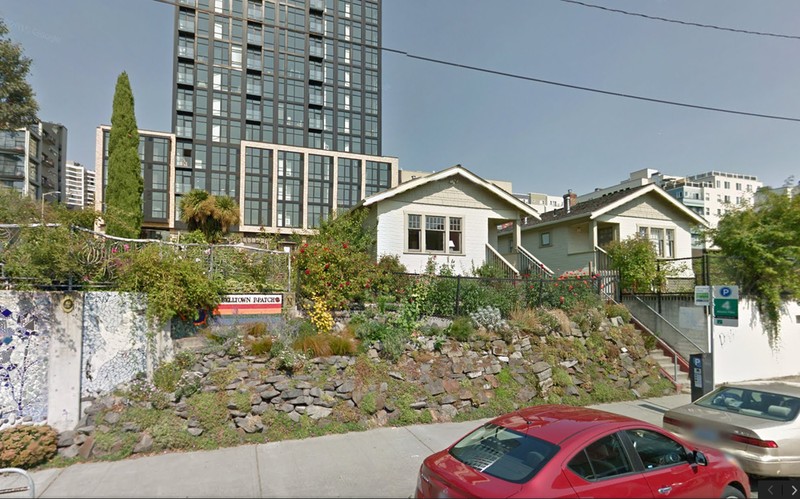 The recipes, however, are home inspired, and come from Dani's grandmother who lives in neighboring First Hill. Of course, the pies are what counts at High 5, and they are super yummy (just look at that crust). I am a fan of the savory pies, which have such unusual ingredients (for a pie) as broccoli. Sure to be noticed when you leave (and are a pound or two heavier), is a large vintage sign above the entrance that was partially re-designed and fully restored by Dani. 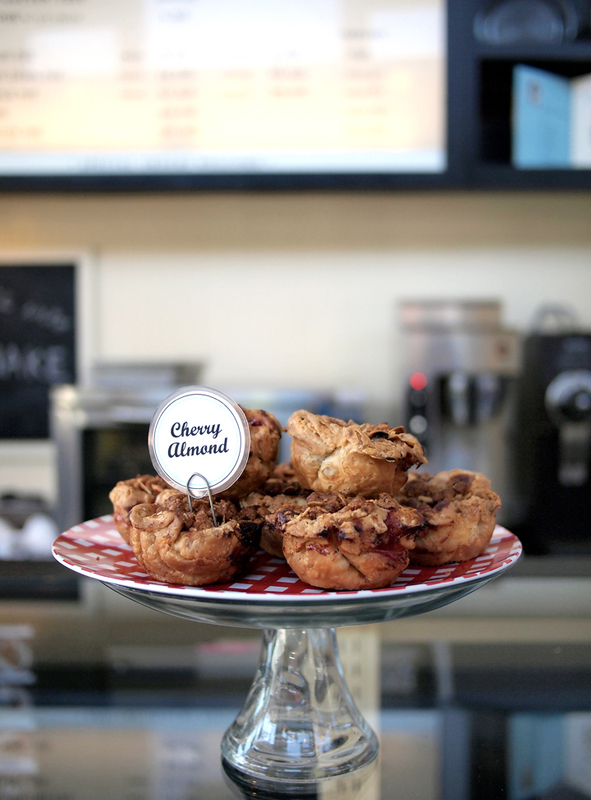 Thoughtful design on a budget and delicious baked are two good reasons to visit High 5, a Capitol Hill based business and very Capitol Hill in its presentation. Can I have seconds?